There’s a catch: for every one of them who dies, the remainder of the 140 get to split that person’s inheritance of $120 million. That’s less than an extra million each, so there’s not a lot of incentive for assassination – unless, of course, you plan to slim down the ranks considerably. That’s not the only catch. We learn that Ferrell’s concept was swiped wholesale from a book from reclusive author Akira, who is also one of the selectees. Ferrell’s administrator Rubenstein is a crazed murderer who seems to have bonded with an intricate tribal mask. And, our regular guy protagonist David keeps hallucinating a leopard in times of stress. Rob Williams is no stranger to electrifying and slightly-subversive comics. He is one of a class of excellent writers who grew from runs on the venerable British weekly book 2000 AD, but I know him primarily from his streak on Daken, the bi-sexual, villainous son of Wolverine. Instead of playing him as a slutty, one-note, slightly-homophobic joke (as he’d probably be played in many comic books), Williams found a way to keep the character viciously sympathetic. I didn’t even love to hate him – I just loved him. Despite some dabbling in other Marvel and DC books, he’s mostly stuck to AD and a run on Doctor Who up until this summer, when he’s writing Suicide Squad with a movie due in a matter of weeks as illustrated by comics most-adored penciller, Jim Lee. There’s no gig any bigger than that without the word “Avengers” in the title! Here, Williams work is drawn by co-creator Mike Dowling, who also comes from the 2000 AD ranks. Unlike Williams, he has no big-two work on his resume since he started creating comics in 2010 (he’s primarily an illustrator and concept artist). Dowling’s art is remarkable, and elevates this book to “must-read” territory. It’s like a cross of Leinil Francis Yu and Michael Lark, blending the brilliant liquidity of Yu’s line work with the stark reality of Lark’s worlds. Dowling dips out for two issues of art, but the combination of Pahek and R.M. Guerra maintain the tone in large part thanks to colorists Quinton Weaver and Giula Brusco. As Ferrell collects his 140 characters onto a private island in Bermuda, naturally some sparks fly. 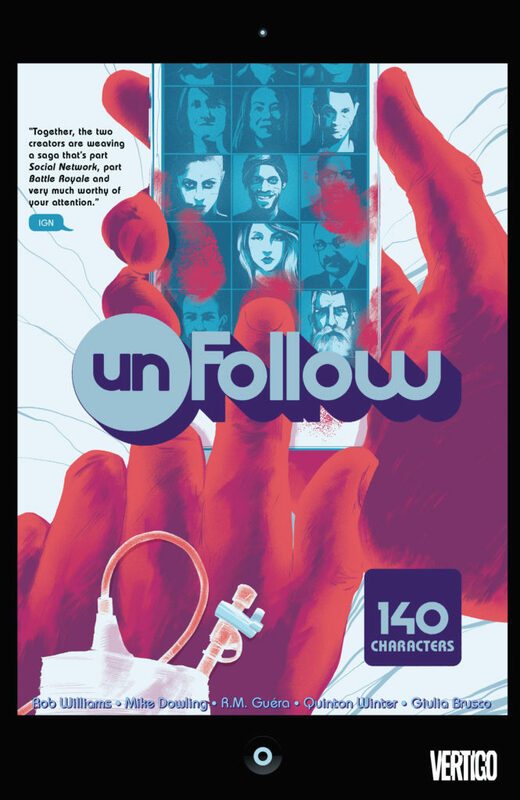 However, the point of Unfollow is not the trapped-on-an-island drama of Battle Royale, but the focus on what happens when they leave, a la the second and third Hunger Games books. There the focus was centered on Katniss’s PTSD and her symbol as a revolutionary. Here, people are simply trying to get back to their normal lives, even as they live them under a microscope and possibly also with a target on their backs. There’s also an element of Lost‘s latter seasons – not in that they sucked, but in that there are 130 other people who we have yet to meet that are a major part of this story just waiting to pop up. Is there anything to criticize here? The social media overlay of tweets and follower counts from the characters feels more like a gimmick than a part of the narrative – I don’t know that there is one caption box that was indispensable. While “140 characters” makes for a cute calling card for a book about the fortune of a dot-com benefactor, Williams still needs to push the plot a bit further to show why the choice was so important. The more subtle issue that gives me more pause is that the named 140 members are each a bit of a stereotype, save for the seemingly more-complex Ravan, the documentarian. Dave being a black kid walking through a gateway of petty crime to protect his genius little sister feels a bit simplistic, especially given his cliffhanger in this volume. Akira is a Asian mysticism trope in the extreme – not that a Japanese character cannot be both deeply wise and ridiculously oblique, but it also feels too easy. 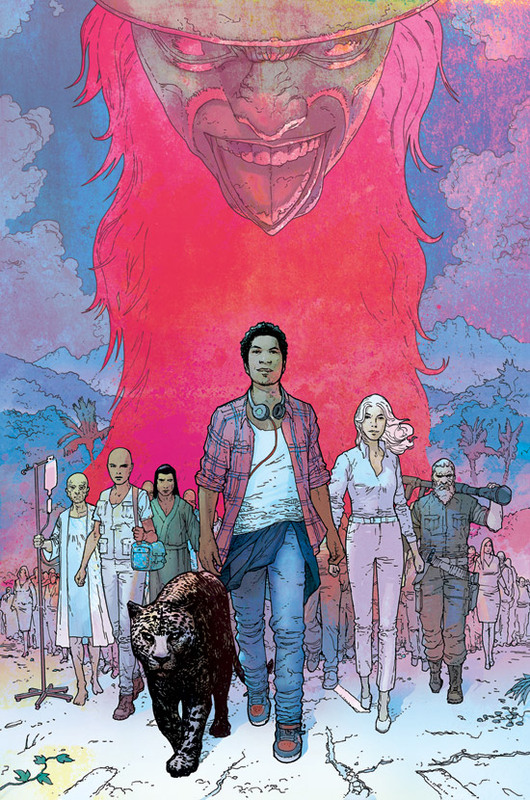 Given the electricity of Unfollow‘s first volume and William’s record – particularly on Daken – I’m prepared to stick around for at least two more collections before I can be a judge of his characters, and I’m certainly not going to miss a single panel of Dowling’s art! We’ve spent so little time with everyone that it’s hard to say if they truly are stereotypes or if that’s just how we’ve chosen to frame them as observers, which is thematically consistent with Ferrell’s legacy being an experiment on humanity. Plus, I’ve got to know what’s happening with that leopard. A second volume is due in December.